Coca-Cola is changing the design for cans and bottles of its diet and low sugar variants, largely keeping the iconic red packaging of regular Coke. Diet Coke, Coca-Cola Light, Coca-Cola Zero and Coca-Cola Life packs will all be revamped to closely resemble the regular Coca-Cola packs – the brands’ ‘Red Disc’ largely covers most of the (black, silver and green) can/bottle. It is a shrewd marketing move – Coke’s flagship red cans and bottles remain the biggest draw for consumers. According to Euromonitor International, regular Coke had a 27% share of the $168bn global soda market in 2015, more than three times the combined share of the company’s diet colas. Consumers clearly associate Coke with its iconic red branding more than any other variant, and the packaging change is designed to push market share. 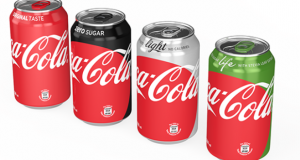 The front of the new cans and bottles will have the words “No Calories” for Diet Coke and Coca-Cola Light, “Zero Sugar” for Coca-Cola Zero and “Less Sugar” for Coca-Cola Life in the company’s latest attempt to highlight caloric options for consumers. The cola giant is launching its “one brand’’ graphics next month in Mexico and plans to introduce variations of that packaging for its zero- and low-calorie Coke brands across much of the world by the end of the year as it tries to boost sluggish sales and tackle health concerns. The soft drinks giant said it is not planning to make the changes in the USA just yet, especially as Diet Coke has a large and loyal following in its home market. Until now, silver has been the primary packaging colour for Diet Coke, which is called Coca-Cola Light in many non-U.S. markets. Coca-Cola Zero, another zero-calorie cola aimed more at men, comes in black packaging. Coca-Cola Life, a mid-calorie cola, is draped in green. The overhaul comes following constant criticism of the excessive amount of sugar in its drinks and allegations that it contributes to rising obesity and diabetes rates across the world. Mexico introduced a tax on sugar-added drinks in 2014 and other countries are weighing similar moves. Coca-Cola Great Britain (CCGB) announced the new ‘Coca-Cola Zero Sugar’ variant, to replace Coke Zero, formulated to taste more like the original Coca-Cola (Coca-Cola Classic), but without sugar. The new drink is backed by a £10m marketing campaign to encourage consumers to try the new and improved Coca-Cola Zero Sugar by highlighting that it ‘tastes more like Coke and looks more like Coke’ than the original Coke Zero.